I wanted to let you know about a new double CD that is really worth checking out. It is a wonderful example of autobiographical storytelling. 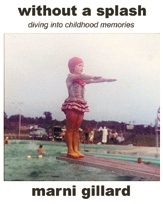 Without a Splash: Diving into Childhood Memories , a double CD by Marni Gillard is oral biography at its finest. The five "interlocking stories" on her CDs begin in early childhood and weave themes of relationship, religion, life lessons, loss and love into a journey well worth taking again and again. Marni's masterful ability to give voice to each character and emotion brings the listener into her world, while simultaneously transporting us back into our own early lives. Marni's honest and vivid depictions of childhood were balm for my soul, returning me to an experience of community, and reminding me of the resiliency of the soul that has been loved. My seven year old daughter has also been fed by these stories, and asks to hear the "Marni CDs" over and over again. "I had to pull myself away"
Thank you so much for your generous spirit, for sharing your stories by recording them. When the package arrived I was on my way to my YOGA class. I popped in CD #1. Twenty minutes later when I arrived at the Yoga class, I had to pull myself away from you. Marni, what can I say...it was as though you were sitting right next to me - the stories, the images you evoked in my mind's eye were exquisite and "real" not to mention the extraordinary quality of the recording. BRAVO! I know what a challenge it was to put this collection of stories together on a recording and I rejoice and celebrate with you! "Without A Splash" is indeed a gift for parents, children, teachers, storytellers, story listeners, one and all. "Your words...reverberate through everyone's soul"
Dear Marni, I've listened to the first story on the CDs five times so far. I can see Jimmy tapping you on the shoulder and crying with you....I love seeing your big brother acknowledge the pain you felt...that's so heartening...I wanted to listen over and over to the story and tell you something that had meaning for me.